The EL2808 digital output terminal connects the binary control signals from the automation device on to the actuators at the process level with electrical isolation. The EL2808 is protected against polarity reversal and processes load currents with outputs protected against overload and short-circuit. 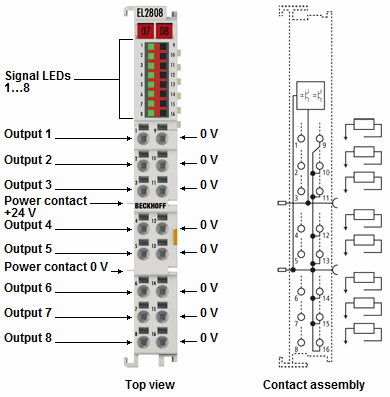 The EtherCAT Terminal contains eight channels, consisting of a signal output and 0 V DC. The signal states are displayed by LEDs. The power contacts are looped through. The outputs are fed via the 24 V power contact in the EL2808. The conductors can be connected without tools in the case of solid wires using a direct plug-in technique.